A tank or container placed lower than, and which receives drainage from, the display aquarium. The obvious first question most beginners have is, "Why in the world would I want one of these? They add more complexity and possibilities for disaster, don't they?" Well, if installed correctly, the many benefits to installing a sump on your aquarium far outweigh any of the few downsides. · keeping the water level stable in the display tank. Let's discuss the last point first. An annoying feature of having a tank full of water in your house is that water evaporates, thereby lowering the water level in the tank. Depending on the size of the tank and the humidity of your house, water levels can easily drop as much as an inch in one day. This can be aesthetically annoying as well as a maintenance headache. A sump may be plumbed into your system in such a way that the water level in the tank remains constant while the water level in the sump lowers with evaporation and raises with the addition of fresh water. Increasing the total water volume in a saltwater aquarium is desirable because the more water within the system, the more stable the system becomes. Water temperature and chemistry will change more slowly in larger volumes of water, which makes it easier to keep the system within optimal parameters. 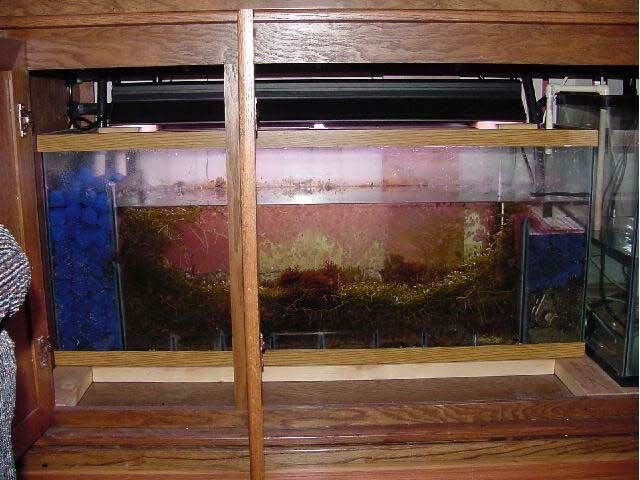 For example, two gallons of evaporation from a 20-gallon aquarium would raise the specific gravity from 1.026 to 1.029, while that same two gallons evaporated from the same 20-gallon tank with a 10-gallon sump attached would only raise it to 1.028, resulting in a much more stable salinity for the aquarium's inhabitants. Having a sump installed on a system allows equipment, such as heaters, filters and skimmers, to remain hidden so that they don't disturb the aesthetics of the display tank. Also, with a sump, it is generally not necessary to keep powerheads in your tank for circulation. Of course, proper circulation must still be maintained and this will be covered in greater depth in Part II of the article. Figure 1. Typical wet/dry sump (with bio-balls removed) with skimmer and heaters inside. Photo courtesy of Greg Taylor. An integral part of a sump is the "overflow". The overflow is the mechanism that drains water into the sump from the display tank. The overflow resides in or "hangs on" the display tank in a fixed position (Figure 2) so that any water that rises above that level in the tank "overflows" through the drain into the sump. This is how the water level remains constant in the display tank. A wonderful side effect of using an overflow to drain water into a sump is that the surface of the water is constantly skimmed, removing undesirable surface films from the tank. This improves gas exchange with the water surface and aids in boosting oxygen levels and lowering CO2 within the tank. Also, not having the surface of your tank look like pond scum is a good thing, don't you agree? Figure 2 . 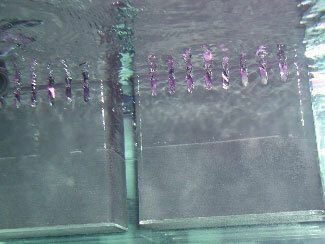 A dual overflow skimming the surface water as seen from below (left) and from the top (right). Photos by Greg Taylor. Additionally, overall aeration of the water is improved by having the water fall over the overflow, down the drain and splashing into the sump. Once again, this assures good gas exchange between the water and air. 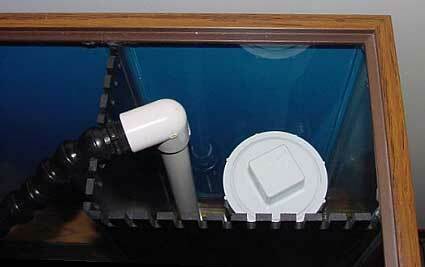 Sumps can also help make water changes a little easier. Water can be removed from the sump without lowering the water level in the display tank. Additionally, replacement water does not have to be lifted up over the rim of the aquarium. A sump is also an excellent place to dose chemicals or to add top-off water. This allows the additives to mix with the existing water before it makes its way back into the tank and disturbs sensitive fish, corals or other animals. There are many different things that can be used as a sump, and for every type of sump there are a dozen ways to use them. 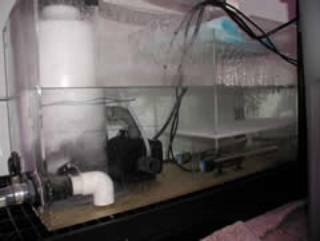 The basic containers commonly used for sumps are small aquariums, custom-built acrylic sumps, small plastic containers, and large plastic "troughs". Figure 3. A sump with live rock filtration (note baffles to reduce micro-bubbles) Photo courtesy of Kevin Pockell. Figure 4. A sump with a simple refugium, also housing heater and submersible return pump. Photo courtesy of Marc Levenson. Sumps can also serve other purposes than for hiding equipment and adding water volume. 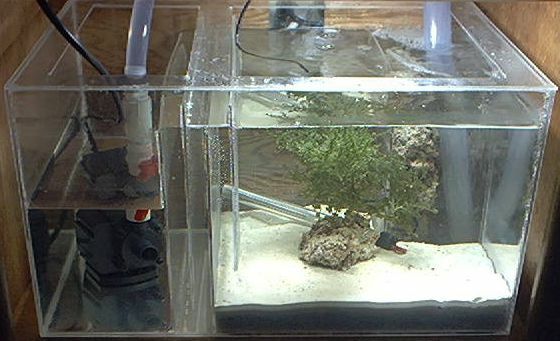 Many aquarists design their sumps to be used as a trickle filter, an algal filter, or a refugium, as well as simply holding water and equipment. Figure 5. 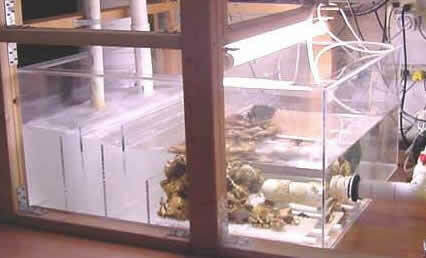 A mature EcoSystem® filter/sump. Photo courtesy of Scott Passe. The plumbing for a sump is actually rather simple, once the concept is understood. A mandatory feature is that the sump must be lower than the waterline in the display tank. 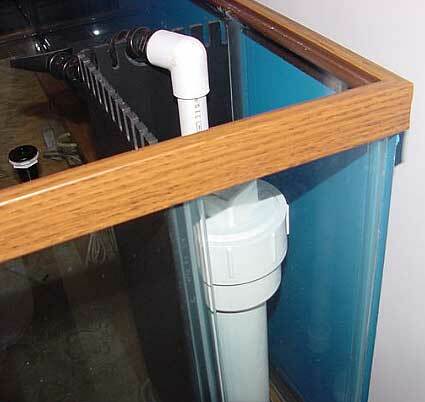 Because of this necessity, most people install their sumps under the tank in the stand. Other possibilities for installation locations are beside the tank, or in extreme cases, some build "fish rooms" in their basements and locate their sump there. It is important to keep in mind, however, that the lower the sump is located, the more difficult it is to return the water back to the tank, as the water will have to be lifted to a higher elevation. Although the overflow, which is the mechanism for removing water from the main tank, has already been discussed, we need to look at them in more detail. In most cases, the ideal overflow is built into the tank utilizing a hole "drilled" into the tank inside the overflow. 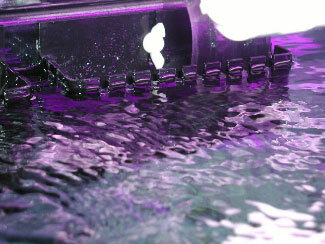 Aquariums with this feature are sometimes called "pre-drilled" or "reef-ready" tanks. If you are planning a new tank and haven't purchased it yet, I recommend you seriously consider purchasing a pre-drilled tank. It is possible to have an existing non-drilled tank drilled to your specifications as well, which is a good alternative for those that already own a non-drilled tank, or want to have the holes drilled in "custom" locations. This type of overflow is quite simple and has few opportunities for failure. The overflow is designed to allow water to spill "over" it a few inches below the tank's rim. Because water will only spill into the overflow if the water level is above the top of the overflow, the water level in the tank will remain constant. Also, no water can drain from the tank after the water level lowers to the top of the overflow. This type of overflow can fail only if the drain hole or drainage pipe become clogged, thereby preventing water from draining into the sump, although it's very easy to prevent this from happening, and is a subject I will go into detail about in Part II of the article. Perhaps the only downside to a drilled tank is that the overflow will take up some space within the tank, thereby reducing the amount of usable area for the tank's inhabitants. Figure 6. 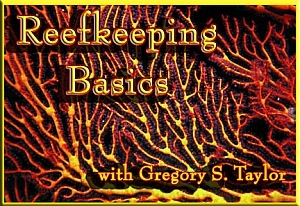 A reef-ready overflow as seen from three angles. The top photo is taken from the front, the middle photo is viewed from the side, and the bottom photo is a top view. Photos courtesy of Skip Attix. A reef-ready, or drilled tank, is of little value to those that already have a tank up and running and don't want to break it down to have it drilled. It is for this situation that hang-on overflows were invented. They hang on the back of the aquarium and extend over into the aquarium. Hang-on overflows (see right) are less reliable and generally can handle less water flow than a "drilled" overflow. This is because overflows must fight against gravity and flow the water "over" the top of the tank rather than through a hole in the tank. Hang-on overflows use a technique called "siphoning" to move the water up and over the edge of the tank and down into the sump. As long as the siphon is maintained, there is no problem, but if the siphon is broken for any reason, then water will cease to flow into the sump and the display tank will continue to fill up until either the sump is drained or water flows over the top of the display tank. Figure 7. How an overflow works. Animation by Greg Taylor. Figure 8. 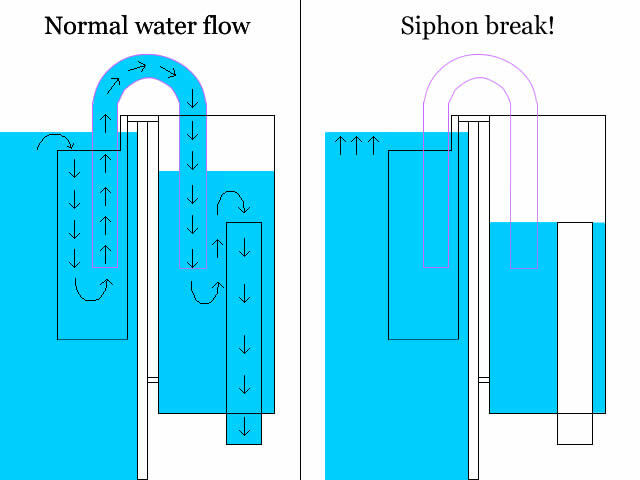 If the siphon tube fills with air, then the siphon will break, preventing any water from draining from the tank. The water level in the tank will overflow until the sump runs out of water, resulting in a flood. Graphic by Greg Taylor. After exiting the overflow, water flows through the standpipe and down the drain line into the sump. From there, the return pump (named such because it "returns" the water to the tank) pushes the water back up into the display tank. This raises the water level in the display tank, which in turn causes water to spill over the top of the overflow, and starting the whole cycle over again. There are very few reasons why a sump is not the best choice. One potential downside to a sump is increased noise. It can sometimes be a challenge to eliminate the noise of water cascading into a sump. In most cases the sound can be easily reduced to inaudible or nearly inaudible levels, but getting to that point can sometimes require a good deal of effort. Reducing the noises associated with sumps is a topic that will be covered in Part II. Another reason to avoid installing a sump is lack of space. 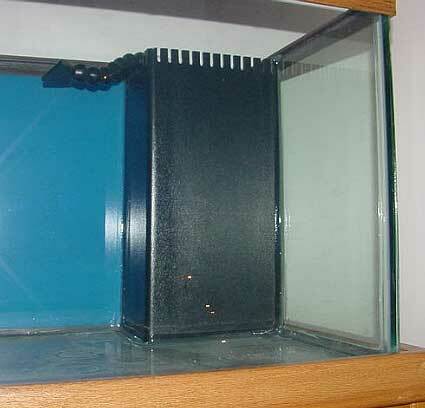 For several years I ran a 10-gallon display tank without a sump. The tank sat on a dresser in a small bedroom, so for obvious reasons a sump was not feasible. As that tank proved, a sump is not required for a healthy, beautiful tank, despite all the benefits a sump provides. Coincidentally, that 10-gallon tank is now being used as a sump for a 30-gallon display tank.